Just experimenting with dyeing beads today! These were so much fun to make that I couldn't stop. 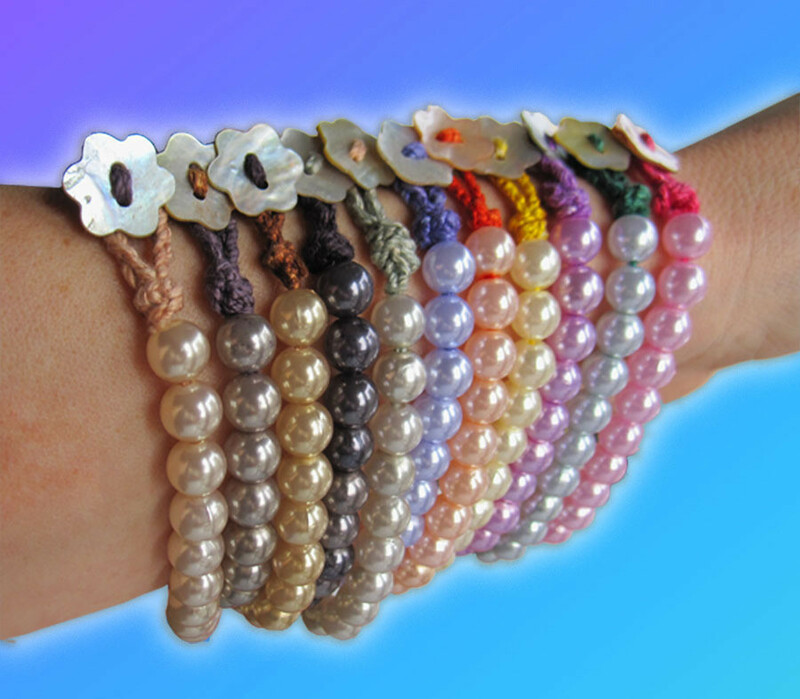 I started with a rainbow of colors for spring time and then did an elegant set of neutral palette bracelets. What's so neat about this neutral set is that it's made with only two colors, tan and black. The different tones are created by simply altering the length of time in the dye bath. Actually, when experimenting a bit more with color mixing and immersion times, it's possible to come up with almost any color combinations one could imagine. Note: Because beads are manufactured with different levels of nylon content, this can effect how well the beads will accept the dye. It's good to do a quick test before you start a big project. The beads I used were Jewelry Essential beads and they worked great. 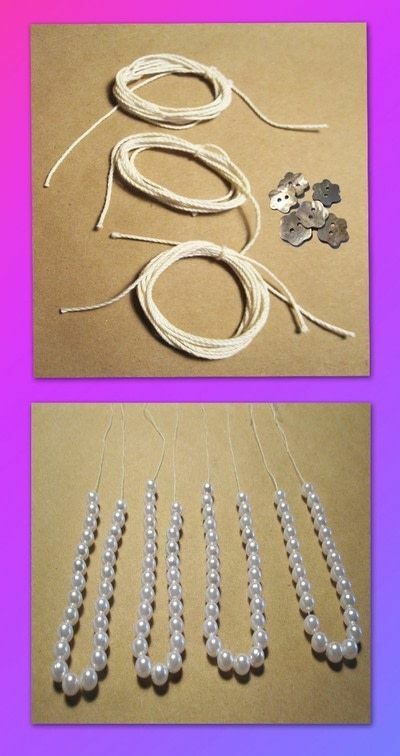 First off, I decided to make matching cord to string the beads. I chose a cotton crochet thread that's about the weight of embroidery floss. Cutting 54" sections, I wound it and loosely tied it so it looked kinda like a mini western lariat. These hold together nicely in the dye bath but are loose enough that the dye can penetrate evenly. I found it helpful to simply string 25 beads on regular sewing thread with some excess thread knotted on top for a handle. This way, I can dunk them in the dye bath and check them easily. Since I was playing with a rainbow of colors, the basic recipe I followed was 2tsp of liquid dye to ¾ cups of hot water. The water was heated in a tea kettle because I found that the beads needed super hot water. The microwave would work just fine here as well. To dye them is easy. 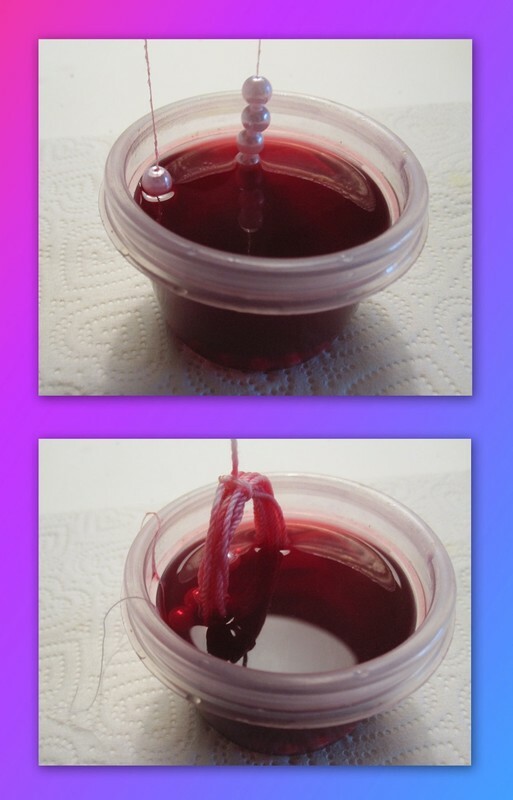 Just immerse the strand in the dye bath leaving the excess thread hanging on the outside of the container as a handle. 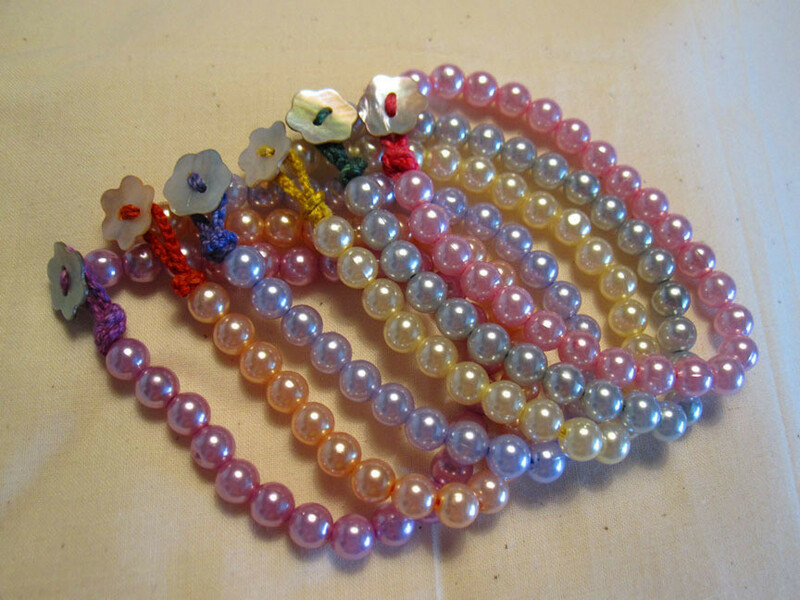 These beads took around 2 minutes of dyeing to achieve color, so check often to get to your perfect shade. The cotton thread bundles were dyed at the same time but needed to be removed much sooner than the beads. They dyed within a minute. I found using a plastic fork was an easy way to remove them from the dye bath. Note: I had my eye on these sweeeeet little flower-shaped shell buttons as a closure for my bracelets. Another idea is to use regular white plastic buttons that you can dye for a total matching experience. Nifty, huh? After dyeing, simply rinse the beads and wipe dry. The cotton thread bundles should be rinsed under cool water until the water runs clear, then washed in warm water with mild detergent. To make the loop end of the bracelet, I started with a simple finger crochet technique. Leaving a nice long tail, I crochet'd section about 2½" in length. 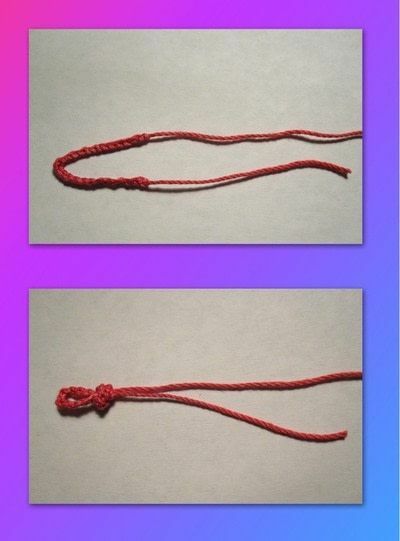 Next, make an overhand loop knot with just the crochet'd section. I love the finger crochet technique. It's something that I learned as a kid and there's no hook needed. 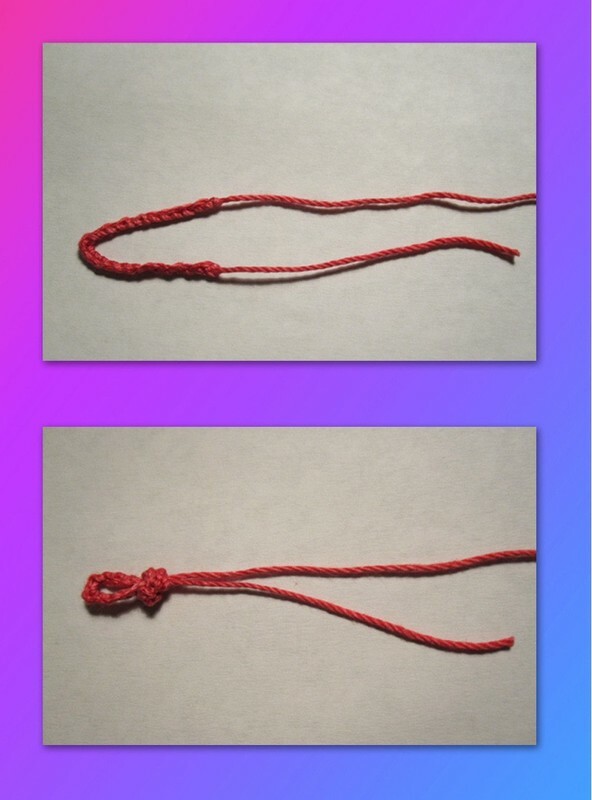 With a needle that's small enough to pass thru the bead openings, I strung the 25 beads and made a knot on the end. I stitched thru my fancy button and then I stitched thru the knot to help secure it. Then I made another knot just under the button. To make a clean finish, I stitched back thru the last bead hole and snipped the thread. For a clean finish on the loop end of the bracelet, I re-threaded my needle with that nice long tail I told you to leave and stitched back into the first bead hole and snipped that thread. There you have it! Your first colorific bracelet. OK, now go make like a gazillion more!! Thank you for this. I was looking for a simpler way to do this. I need to dye white beads for a cosplay, since I couldn't find them in the right color. I'm always buying beads because I don't have the right colors! Not anymore!! Thanks Edie!! Yeah, it is really easy to do. I've got in the habit of making accent beads for a ton of projects. If you're gonna try it, my best 2Â¢ is make sure the water's really hot. 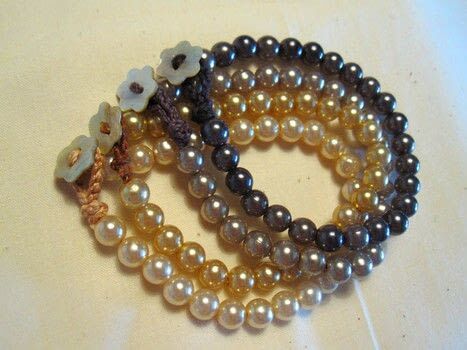 I have been looking at colored pearl beads EVERYWHERE and just couldn't bring my self to pay so much for them. And now I don't have to! This is great!